Carnival, which is also in Barcelona, is the time of joy, exuberance and joie de vivre, before Ash Wednesday when the 46-day Lent to Easter begins. Carnival, in Catalonia "Carnaval" is celebrated as in Central Europe. One disguises oneself, there are carnival events and parades, which are almost as colourful as in Cologne or Mainz. And the bars are full. The special costumes, the typical disguises and wizards make this carnival so worth seeing. Children will love the carnival in Barcelona, also. If you tend to dislike carnivals and would like to take refuge from the clownish goings, we can relieve your mind. In Barcelona, El Carnaval is not as ubiquitous as in Mainz at the carnival or the Swabian-Alemannic Fasnet. The carnival begins in Spain with "Dirty Thursday", in Barcelona this day is called Jueves Ladero - Greasy Thursday, or Dijous Gras in Catalan. This day is dedicated to the "Greasy" and "Vice" and celebrated with many festivals in which vast amounts are eaten. The weekend belongs to the Carnival Guilds. The popular Big Parade Gran Rua does not exist anymore. 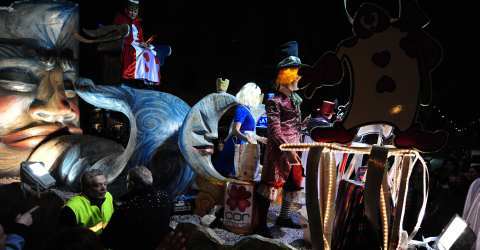 But there are many local events and local carnival parades all over Barcelona throughout the carnival weekend. We recommend the carnival parades in the Ribera/Born area of Barcelona old city. The highlight is "La Taronjada" on Sunday - a colourful battle of orange balloons and confetti at the end of a parade in the Ribera/Born district. On Ash Wednesday the carnival comes to an end with the funeral of the sardine. The King of Carnival dies and is buried in his grave in a funeral cortège, accompanied by his widow and companions - the colourful costumes are appropriately exchanged to black mourning clothes. For those who like it shrill one should go to El Carnaval in Sitges which is approximately 15 kilometres away. In the gay and lesbian stronghold the atmosphere is very shrill and eccentric, and the parade is unique. In Sitges, the Carnival has been celebrated for over 100 years. On Dijous Gras - the Dirty Thursday – King Carnestoltes, the King Carnival, moves to Sitges. Highlights in Sitges are Rua de la Disbauxa on Sunday and Rua de l'Exterminiam on Tuesday afternoon. Even children will be delighted by these two parades. To reach Sitges you can simply take the train. Trains depart from the main station Sants to Sitges. The trip takes about 40 minutes.